For the British agricultural researcher, see Derrick Thomas (agricultural scientist). For those of a similar name, see Derek Thomas (disambiguation). Derrick Vincent Thomas (January 1, 1967 – February 8, 2000), nicknamed D.T., was an American football linebacker and defensive end who played for the Kansas City Chiefs of the National Football League (NFL). Thomas was drafted fourth overall by the Chiefs in the 1989 NFL Draft where he spent the entirety of his 11-year career until his death in 2000. Considered one of the greatest pass rushers of all time, he was named to nine Pro Bowls and holds the record for most sacks in a single game at seven. 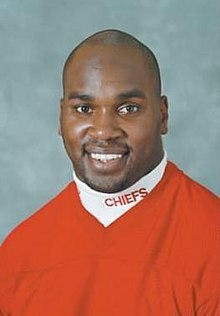 After the conclusion of the Chiefs' 1999 season, Thomas was involved in a car accident during the 1999–2000 NFL playoffs that left him paralyzed from the chest down. Days later, he died from a blood clot that developed in his paralyzed legs and traveled to his lungs, causing a pulmonary embolism. Thomas was posthumously inducted into the Pro Football Hall of Fame in 2009 and the College Football Hall of Fame in 2014. Born in Miami, Florida, Thomas was raised by his mother. His father, Air Force Captain and B-52 pilot Robert James Thomas, died during a mission in the Vietnam War. Thomas started playing football when he was three years old, and played his high school football at South Miami Senior High School. Alongside Cornelius Bennett and later Keith McCants at Alabama, Thomas spearheaded one of the best defensive lines in college football and smashed many Crimson Tide defensive records, including sacks in a single season. He was awarded the Butkus Award in 1988 after a season which saw him set an NCAA record 27 sacks along with finishing 10th in Heisman Trophy balloting. He currently holds the single season NCAA FBS sack record with 27 and what was the career sack record with 52 career sacks. He was also selected as a unanimous All-American at the conclusion of the 1988 season, a season which culminated in the Crimson Tide's thrilling 29-28 victory over Army in the 1988 Sun Bowl. In 2000, Thomas was named a Sun Bowl Legend. He was awarded the Sington Soaring Spirit Award by the Lakeshore Foundation. This annual award is named for University of Alabama football legend Fred Sington. Thomas was elected to the College Football Hall of Fame in 2014. Thomas' rookie year earned him the Defensive Rookie of the Year award by the Pro Football Weekly/Pro Football Writers of America and the United Press International AFC Rookie of the Year award. He was the first Chiefs' linebacker to be elected to the Pro Bowl as a rookie since Hall of Fame player Bobby Bell. Thomas was known for his ability to sack the quarterback and was named a First Team All-Pro two times, Second Team All-Pro four times, and was voted to nine Pro Bowls in his 11-year career. He totaled 126.5 sacks in his career, and as of the start of the 2017 NFL season, holds the single game record of seven quarterback sacks, a feat which occurred against Seattle's Dave Krieg on 1990 Veterans Day. Ironically, it was a sack that Thomas did not get that decided the game: on the final play, Krieg eluded a blitzing Thomas and threw a touchdown pass to Paul Skansi, which gave the Seahawks a 17–16 win. The next player to come close to breaking this record was Thomas himself, recording 6 sacks against the Oakland Raiders in the regular season opener in 1998. He is one of 32 NFL players to achieve 100 or more sacks, and ranks as the Chiefs' all-time sack leader with 126.5. Thomas is also the seventh all-time tackler in Chiefs' history with 642 career tackles. During his career, he recorded 1 interception and recovered 19 fumbles, returning them for 161 yards and 4 touchdowns. Thomas established Chiefs career records for sacks, safeties, fumble recoveries, and forced fumbles. On January 23, 2000, Thomas' 1999 Chevrolet Suburban went off Interstate 435 as he and two passengers were driving to Kansas City International Airport during a snowstorm for a flight to St. Louis to watch the NFC Championship Game between the St. Louis Rams and the Tampa Bay Buccaneers. Police reports indicated that Thomas, who was driving, was speeding at approximately 70 m.p.h. even though snow and ice were rapidly accumulating on the roadway. Thomas continued weaving erratically through traffic despite the weather. Thomas and one of the passengers were not wearing seat belts and both were thrown from the car; the passenger was killed instantly. The second passenger, who was wearing his safety belt, walked away from the scene uninjured. Thomas was left paralyzed from the chest down. By early February, Thomas was being treated at Miami's Jackson Memorial Hospital. The morning of February 8, 2000, while being transferred from his hospital bed to a wheelchair on his way to therapy, Thomas told his mother he was not feeling well. His eyes then rolled back, recalled Frank Eismont, an orthopedic surgeon at Jackson Memorial Hospital. Eismont said Thomas went into cardiorespiratory arrest and died as a result of a pulmonary embolism, a massive blood clot that developed in his legs and traveled to his lungs. Months later, Thomas' family sued General Motors for $73 million in damages stemming from the accident that Thomas caused. In 2004, a jury ruled that the family was not entitled to any money. In 1990, Thomas founded the Derrick Thomas Third and Long Foundation. The foundation's mission is to "sack illiteracy" and change the lives of 9- to 13-year-old urban children facing challenging and life-threatening situations in the Kansas City area. On January 31, 2009, Thomas was posthumously named among six players selected for induction into the Pro Football Hall of Fame, his fifth year of eligibility. He was officially posthumously inducted in Canton, Ohio on August 8, 2009, after four years as a finalist in the Hall of Fame voting. The Chiefs announced on June 23, 2009, that they would retire #58 in honor of Thomas, and the retirement ceremony took place on December 6, 2009, when the Chiefs played the Denver Broncos. The Derrick Thomas Academy, a charter school in Kansas City, Missouri, opened in September 2001. It served nearly 1,000 children from kindergarten through eighth grade until it closed in 2013. The Chiefs named their player of the year award in Thomas' honor. ^ "Top 10 pass rushers in NFL history". NFL.com. October 7, 2008. Archived from the original on February 6, 2009. Retrieved February 1, 2009. ^ National Football League. "NFL Draft History - 1989". National Football League. Retrieved December 3, 2017. ^ National Football League. "Derrick Thomas Player Profile". National Football League. Retrieved December 3, 2017. ^ Pro Football Reference. "Derrick Thomas". Pro Football Reference. Retrieved December 3, 2017. ^ Sports Illustrated. "Most NFL Single Game Sacks". Sports Illustrated. Retrieved December 3, 2017. ^ Kansas City Chiefs. "2017 Kansas Chiefs Media Guide" (PDF). Kansas City Chiefs. Retrieved December 5, 2017. ^ "Chiefs' Thomas dead at 33". CNNSI.com. Associated Press. February 8, 2000. Retrieved August 26, 2013. ^ "Blood Clot Killed Thomas, Doctors Say". CNNSI.com. Associated Press. February 10, 2000. Retrieved August 26, 2013. ^ "Thomas family sought $73M in suit". ESPN.com. August 17, 2004. Retrieved August 26, 2013. ^ Covitz, Randy (January 31, 2008). "Derrick Thomas elected to Hall of Fame. His son accepted the award in the hall of fame for Derrick Thomas". Kansascity.com: The Kansas City Star website. The McClatchy Company. Archived from the original on February 1, 2009. Retrieved February 1, 2009. ^ "Hall of Famers: Yearly Finalists". Pro Football Hall of Fame website. Retrieved February 1, 2009. ^ "LB Derrick Thomas Will Have His #58 Retired, Family to Receive HOF Ring at Arrowhead vs. Denver on December 6th". Kansas City Chiefs Website. Archived from the original on June 27, 2009. Retrieved June 23, 2009. ^ Koepp, Paul (July 24, 2013). "Closing of Derrick Thomas Academy leaves legal mess". Kansas City Business Journal. Retrieved February 12, 2017.